Chiropractic Services: Ocean Chiropractic and Health Center provides advanced spinal correction utilizing drug-free, state of the art chiropractic techniques. Never in the history of chiropractic have we been able to provide the level of expertise and assistance that now exists. These newer correction methods are more comfortable and more effective than ever before. As Doctors of Chiropractic, Bradley Deiner, DC and Jennifer Carter, D.C have years of training and experience in spinal adjustment. We often find it helpful to educate patients on certain activities they should avoid or do differently to escape aggravating their particular health challenge. Our goal is to provide support and services to every patient in helping to achieve a fulfilling and happy lifestyle full of the activities that they enjoy most. Massage Therapy Services: Massage therapy offers a natural conservative treatment approach that relieves musculoskeletal pain for many patients. Our office provides specific massage services and muscular therapy that is tailored to meet the patient’s condition and possible injury. 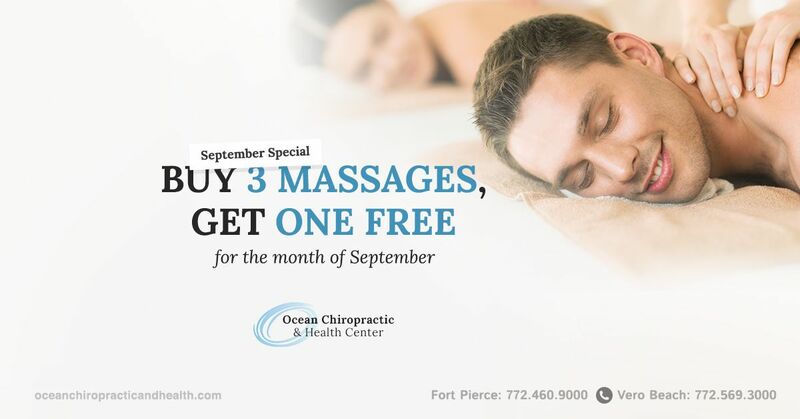 The benefits of massage therapy offered at Ocean Chiropractic and Health Center may include increasing blood circulation, reducing swelling, relaxing muscles, relieving muscle pain and spasms, and increased range of motion. Ocean Chiropractic and Health Center offers massage therapy services such as medical massage, range and motion techniques, deep tissue, ortho-bionomy, Swedish massage, cranial sacral and lymphatic massage. Please call our office for availability and to verify insurance coverage and to hear our latest massage specials. Physical Therapy: At Ocean Chiropractic and Health Center provides physical therapy services based on the needs of our patients. Whether it be post surgery, post-automobile accidents, worker’s compensation accident, slip and fall accident or gait training to help prevent home accidents in the elderly, your therapy plan will be tailored just for you. Once a patient has met their in-office therapy goals, home care exercises and instructions will be given to further facilitate the continued improvement and to maintain the progress made. Nutritional Counseling Services: Ocean Chiropractic and Health Center can provide specific recommendations on nutritional supplements and healthy food choices to enhance a patient´s return to optimal health. Do you know which supplements and vitamins are good for you? Do you know how these supplements and vitamins interact with one another? Our doctors can provide a structured nutritional program based on your individual needs.